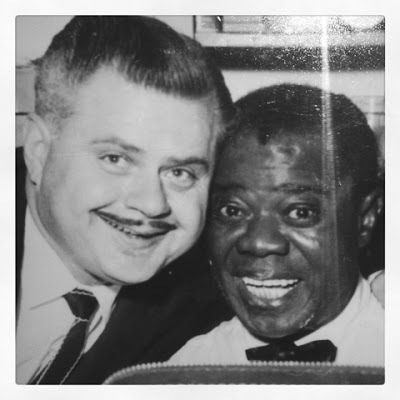 I was over at my parent's place this afternoon and on the shelf at the foot of their stairs is this photo of my grandfather, Kenny Fulcher, and the great Satchmo, Louis Armstrong. It's a favorite photo because it shows my grandfather ("Bebop", as we called him) with one of his biggest influences and fans. When Mr. Armstrong was in town (Washington, DC), he would stop by the old Charles Hotel to hear the Booker Coleman Jazz Band play. Bebop was the trumpet player in the band. Mr. Armstrong would always be recognized and could be talked into joining the band for a number or two, and since he played the trumpet, he used Bebop's horn. The photo was taken around 1959, I believe. Fast-forward to last year. My mother bought a book that fascinated her called, "Satchmo: The Wonderful World and Art of Louis Armstrong", by Steven Brower. The book contains copies of photos from Mr. Armstrong's personal collection of scrapbooks, notes, and pictures. On page 59 of the book is the above collage of photos. 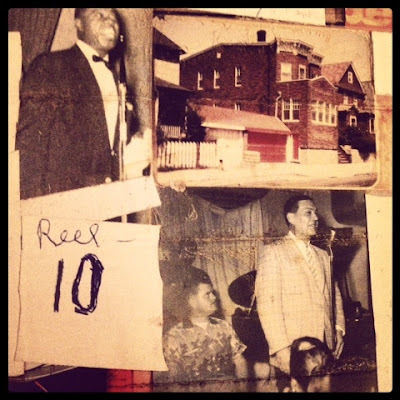 The lower right picture is of my grandfather (sitting) next to Jack Teagarden, a jazz singer (Mr. Armstrong is in the upper left picture, and the home he lived in with his wife is in the upper right). Imagine my mother's surprise when she came across this picture while paging through the book! Anyway, I was looking through it today and it had me thinking about Bebop. He was one of the better local DC-area jazz musicians, and a heck of a trumpet player. One national jazz magazine of the day called him the best "unknown" trumpet player in the world. I could only hope to have an ounce of his talent. I wish I had been able to see him play in his prime. As it was, I only saw him when he performed at the Rockville, MD, Shakey's pizza parlor with a Dixieland band called Southern Comfort, which performed each Friday through the late 70s. He suffered through a stroke a few years later that incapacitated him enough to end his playing days. He had polio when he was only a year old, and it paralyzed one of his legs, so he had to use crutches for most of his life. It never stopped him from achieving great things, and he was a truly great man. I'm honored to call him my grandfather. He and my grandmother, Esther, passed away in 1987. I love our connection to Mr. Armstrong through my grandfather. They knew each other by name, which I think is kind of cool. Both were taken from this life too soon.